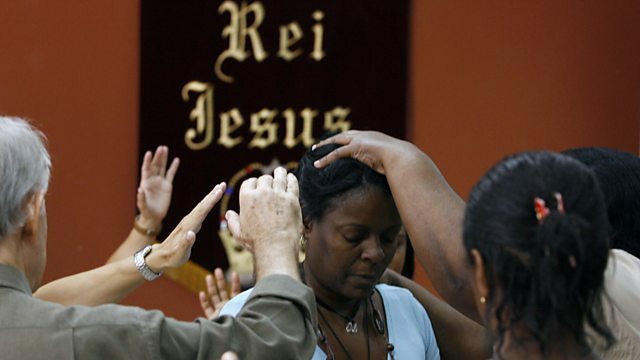 Millions of Brazilians are turning to Evangelical Christianity. Paulo Cabral reports from Sao Paolo on why they are turning away from the Catholic church. It was once the case that Brazilians worshipped as one in the thousands of Catholic churches spread around this vast country. But a religious revolution is taking place, and a new dynamic form of charismatic Evangelical Christianity is taking over. A quarter of Brazilians now worship in Evangelical churches, many of them practicing the Prosperity gospel which promises them happiness and fulfilment in return for a proportion of their wealth. And its wealth, along with power and influence, which the Catholic Church previously claimed as its own, is the result of this increased membership. Paulo Cabral investigates why Brazilians are turning form the Catholicism which has had a presence in Brazil for over 500 years, and how the charismatic churches have become so popular changing the way many Brazilians in some of the poorest areas of the country profess their faith and accumulating this vast wealth and political power along the way.